“Listen, the wind is rising; the air is wild with leaves. Now that it’s October, I’m really feeling the fall spirit. Colors are changing fast around here, like those small pieces of glass in a kaledioscope. I noticed our hydrangea is showing hints of lavendar and purple on its leaves, and the berries on the dogwood trees are bright red–as red as the cardinals that like to wash them in my birdbath and eat them, leaving the seed pits for me to clean out. Today the wind is whistling around my house like mad, throwing leaves into the air, and it’s cooled off nicely. Listen closely tonight, if you live in the southeast. 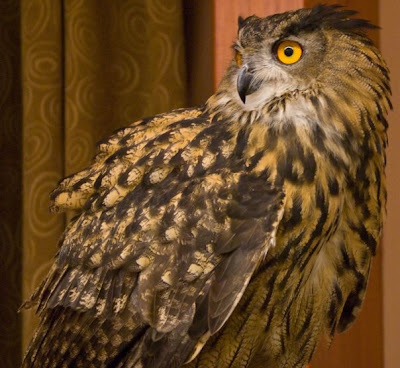 It’s time for great horned owls to hoot into the woods, searching for mates. What a beautiful bird and I do believe orange eyes are definitely his colour !